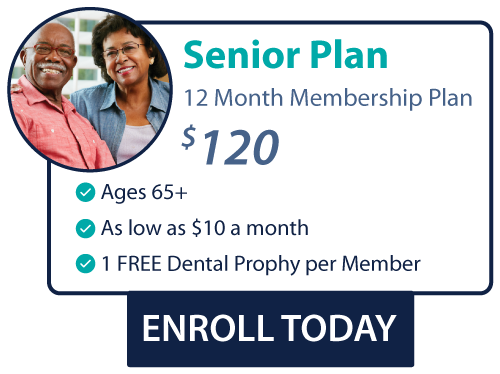 Choosing a dental health plan that is right for you is very important and Dental Direct is one of the only discount dental plans that provides a membership discount to seniors 65 and older. Our Senior Dental Plans offer the same savings and services available in our Individual and Family Membership Plans. The only difference is we want to make your plan a little bit more affordable to help you maintain a healthy dental lifestyle. Dental Direct makes it easy and affordable for seniors to keep their smile healthy for a lifetime. If you are a senior interested in maintaining your dental health, enroll today and get 3 years of coverage for the price of 2. Enrollment and policy activation is immediate, so sign up today so sign up today and start your journey to a long lasting healthy smile. 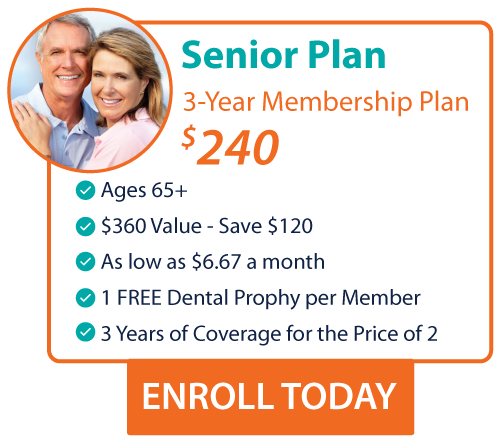 Enroll today with our 3-Year Senior Dental Plan Membership and get 3 years of coverage for the price of 2. That’s 1 full year of dental plan coverage for FREE! Additionally, with our Senior Dental Plan, you will receive 1 FREE dental cleaning annually at any one of our participating dental offices.